The weekend just gone was a bank holiday here in the UK, which means a 3 day weekend. Normally that would mean taking the girlfriend away, or at least some kind of expedition. However, having rocked a fat one Friday night I really wasn’t up for anything adventurous. So what does a chap do when feeling a little worse for wear? He surfs the net for ties of course. In particular I was looking for Mogador ties. Two things became apparent very quickly; firstly, they were thin on the ground – so thin I struggled to find a picture. Secondly, many retailers didn’t even seem sure what Mogador was, often confusing it with poplin. First things first, both Poplin and Mogador have a slightly ribbed weave, and both are made by weaving two different materials together. In the case of Poplin, a silk warp is shot through with a wool weft. And I should say that what we are really talking about is Irish Poplin, as made famous by Atkinsons, as opposed to shirting Poplin which is pure cotton. Mogador fabric is a mix of silk yarn in the warp, and finest cotton in the weft. The name is derived from a port in Morocco from where this cloth originates. In both cases you are using the silk to provide vibrant colour and the wool or cotton with its thicker more ridged threads to provide a solidity which in my view creates a beautiful hand. In addition colours are vibrant and rich but they don’t have the shine of pure silk weaves. Now, most people advocate Irish Poplin for summer, but being a fan of the qualities of cotton ties I personally rather like Mogador for spring and summer. Their dull shine, but richness of colour (an attribute of the cotton), light weight and rigidity make them ideal pairings with cotton or linen suiting and set up an even better contrast with that other warm weather fabric, Mohair. And now you know how I spend my spare time, it’s a wonder I’m not single. Nice post. I had never thought about fabrics mixing fibers on the weft and warp before… very cool. 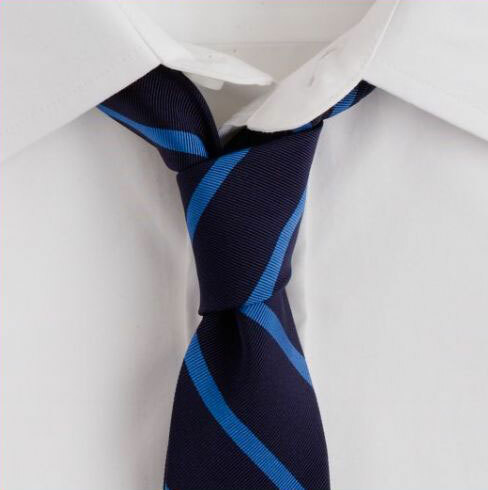 So you left us hanging – did you ever find a Mogador tie? Sadly not as yet. Dunhill carry them but their website was down. I’d heard Brooks Brothers regularly stocks them also, but I’d have to go in store.